Carla Benejam lives in Salinas, California with one of her three sons and a big tabby cat. 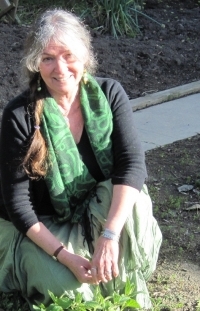 When not teaching courses in biology, life science, or psychology at Cal State University Monterey Bay, she spends many days in her apothecary garden, growing and tending herbs and seasonal veggies. Carla has been teaching for ten years and before that owned a rather eclectic used book store in Monterey. She has an affinity for languages and has studied German, French, Spanish and Indonesian, and a little Italian. Travels have taken her to Sumatra (to see young orangutans in the wild), Fiji, Moscow, Singapore and the Malay Peninsula, Britain, France, Spain, Alaska and Hawaii, Nepal, India, and Tibet. Carla has a bachelor’s degree from UC Berkeley in Physical Anthropology, and a master’s degree from San Jose State College in Evolutionary Biology. On December 27, 2013, she defended her dissertation and completed her doctorate in Psychology from Saybrook University in San Francisco. She is currently preparing a program of biofeedback for stress relief for college students to be implemented at her university, and is also pursuing life as a garden wise woman. Although a Psychology student, the three individuals guiding her dissertation were all faculty from Saybrook’s School of Mind-Body Medicine, chair Donald Moss, and committee members Eric Willmarth and Eliza Bigham. During her years at Saybrook, Carla Benejam was introduced to two subjects that profoundly influenced her course of study: biofeedback and hypnosis. Study in these areas allowed her to look deeper into the human psyche and into the connections among the human mind, behavior, and physiology. She wanted to understand what effects the mind, a person’s thinking, could have on personal health and on the body, and also how changing the body could affect a person’s thinking. To this end she chose a research topic that would allow her to study the relative effects of two mind-body interventions (thermal biofeedback and yoga) on the stress levels of college students. She is a college teacher and wanted to conduct research with the students from her own university. This turned out to be a good choice for her and helped her to increase her understanding of the mind-body connection. Further she was able to investigate how enhancing the students’ awareness of this mind-body connection could improve the way students are able to cope with stress while in college. Another important aspect of her time as a graduate student at Saybrook was the social world that presented itself to her. Both faculty and other students were interested in her questions, and encouraged her every step of the way to keep on looking, keep on learning, and keep on her path. One of the most valuable parts of her education at Saybrook was this interchange of ideas with other students. Even though each student pursued his or her own directions and passions, there was always an open and friendly dialogue among the students. Attending the Residential Conferences was a highlight of every semester, and something that she will miss now that she has graduated! Faculty from Saybrook would sit alongside the students during dinner, and discussions involved many fascinating ideas. Everyone was engaged in some way, and the support and positive conversations always gave her energy to return home and dive even deeper into her studies. Carla’s research involved her in close interactions with her student participants when teaching them ways to reduce stress, and when showing them how effective biofeedback can be as a technique for teaching relaxation. She was pleased at how receptive the students were to learning new techniques, and how they perceived the results of the study in a most positive way. Her research results showed that the biofeedback intervention significantly reduced the students’ perceived stress, more effectively than the yoga intervention.